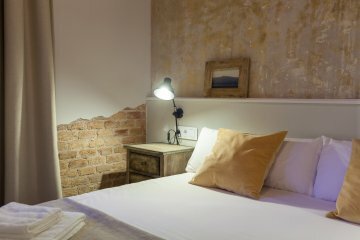 Located in a modern building with a great location at only 100m from Sagrada Familia, Gaudi's most important work. There are five different apartments in Barcelona in this same category, one on each floor. This two bedroom apartment is very quiet and luminous. Very convenient two bedroom apartment for business travellers since there are two double bedroom both with queen size bed, one of them with ensuite bathroom. In the cosy living room you can enjoyresting on the comfortable sofa while watching TV with international channels. The modern kitchen is opened and fully equipped for cooking any meal you feel like. Other facilities included in the apartment: wifi and air conditioning in the whole apartment and elevator in the building. 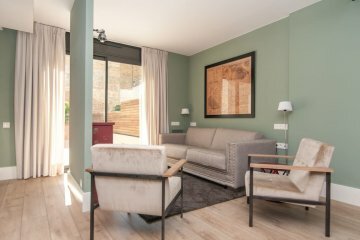 These holidays apartments Barcelona are available for monthly rentals and price includes utilities and a weekly cleaning.